A group of 13 athletes at Murrieta Mesa High School was recognized Wednesday for receiving college athletic scholarships. 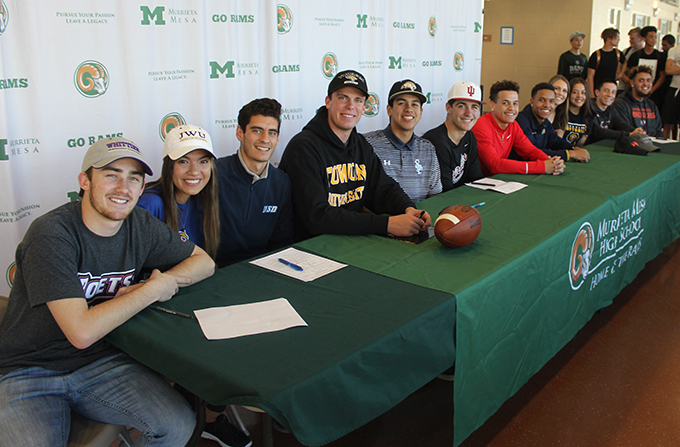 The largest group ever to sign letters of intent in a single year was honored Wednesday when 13 Murrieta Mesa High School seniors accepted college athletic scholarships. A large group of students, parents and administrators applauded the seniors -- some of whom had signed during the fall early signing period. Coaches introduced their honored athletes and told about their accomplishments, and each athlete was given an opportunity to speak. The group includes four football players. Quarterback Jeff Miller, who passed for 5,931 yards and 61 touchdowns in his high school career, accepted a scholarship to Towson University in Maryland. Teammate Giovanni Sanders finished with 1,695 yards and 23 touchdowns receiving last fall. He will play for Dixie State University in Utah. Two other football players have accepted scholarships. Lineman Titus Slater signed a letter of intent with Snow College in Utah and cornerback Capone Blue will attend Kent State. Antonio Carreon, who was a pitcher on the school's 2016 CIF championship baseball team, will attend San Diego Christian College. Autumn Pease, who is headed for Idaho State, will become the first Mesa softball pitcher ever to play the sport in college. Also honored was soccer player Taylor Perales, who will attend the University of San Diego.